Whitterer on Autism » Blog Archive » My Child Has Autism, Now What? My Child Has Autism, Now What? By Susan Larson Kidd published by Jessica Kingsley Publishers Inc. This slim volume is an ideal first read for parents and carers of children who have just found out about autism. Susan Larson Kidd’s book demonstrates her years of experience in a forthright manner, avoiding jargon and with many practical examples, hints and tips. Her ten chapters or steps give a broad overview of many of the pivotal issues that parents and children face, the realities of daily life, right down to the basics. How basic? The first chapter covers sleeping, eating and toileting, so yes, it’s a lot to cover but often, certainly for our family, that’s exactly what we needed, somewhere to start, right back to the fundamentals. 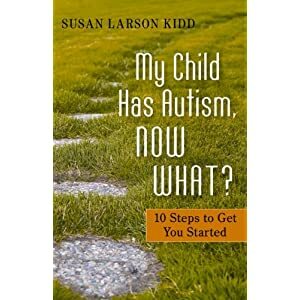 This is why I like this book so much because as the title says, ‘my child has autism, now what?’ that’s exactly how it feels at the beginning and how Susan Larson Kidd describes that emotional response in her introduction. Many parents are completely overwhelmed and do what I did—hit the internet for information with thousands of entries, become distracted by the adverts down the side claiming cures by everything from chelation treatments to snake oil—and experience anxiety. We’re buried in information, too much. We need a primer and a starting point and that is what this book provides. There are many other ways of describing the topic but this conveys a different message entirely. Not only that, Susan then goes on to explain why visual supports are helpful. Then, she gives a whole host of practical suggestions that do not involve spending vast quantities of money on fancy specialized and expensive equipment. It’s a ‘can do’ approach which avoids so many pitfalls that can snare the unwary. It’s easy to forget how vulnerable parents can be when they’re children are first diagnosed, and I would take issue with the chapter on biomedical interventions but any writer on the subject of autism is obliged to address the matter. She provides any number of useful websites, which is also helpful as I can remember being directed to similar sites or finding my own, only to discover that I’d inadvertently connected my computer to a virus or adverts. I particularly liked the PEC site where you can design a schedule for free [very important the free] as long as it’s for your private use. Throughout, the book is sprinkled with illustrations and examples which help drive a point home, clarify concepts and de-mystify complex issues. But if you need any further convincing I would draw your attention to one short paragraph. In my copy it’s on page 86, where Susan Larson Kidd tells me that she is crazy and provides an example of her craziness for me, the reader, to assess. Her example tells of an autistic child in pre-school who hits. She then goes on to describe the different strategies that the professionals adopt to address the problem—a visual which says ‘no hit,’ accompanied by a symbol. Why might this approach be a mistake? –she asks. It seems like a solution, why would that be crazy? There are rarely right or wrong answers in autism. Wouldn’t that be a good way to start? To be fair, I mis-quoted Susan. She didn’t really say she was crazy, just that some of the things she sees professionals do [and I expect we parents are guilty too] drive her crazy. If you are the parent of an autistic child, maybe you can see some of the pitfalls in this approach. I can now, but I don’t think I would have done a few years ago and that’s why this is such a great book, because it makes us think about what we do and how we do it. This is a book that helps parents understand the underlying issues so we are better able to help our children. It gives us a starting point, what to do, how and why. And if you want to know the answer, you can buy the book from JKP or Amazon but I’ll give you a hint in the meantime–we need to ask ourselves ‘why’ the child is hitting, ‘what’ the hitting tells us and ‘what do we need to teach the child to communicate instead?’ Now that’s my kind of crazy – thanks Susan. Posted on October 3rd, 2010.